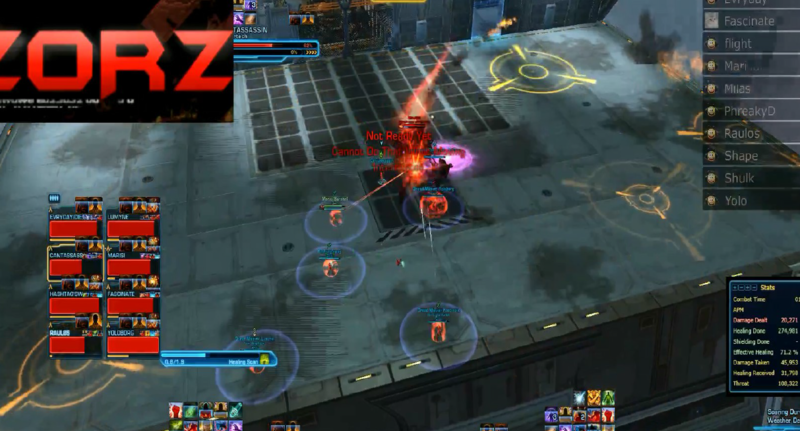 SWTOR Hardmode Master and Blaster Ravagers Operation Guide written by Zorz guild of Harbinger. Full 192 (Resurrected) gear is sufficient. There are several significant changes to this fight in Hardmode. Blaster’s Ravager Ultra Scatterblast knockback is extremely damaging and also launches anyone caught in it very far (about 4 times further than Storymode). Also, anyone with mines (Resonant Explosive Probes) must be extremely careful, since colliding into another player with a mine causes a damaging collision and knockback, potentially sending players into ground reticles or off the edge of the map. The Rejiggering phase at the end is much harder since Blaster and B0-55 must die at approximately the same time, due to the buff provided by B0-55 which enables the raid to survive Blaster’s Ravager Electro-Pulse Nova (huge knockback). 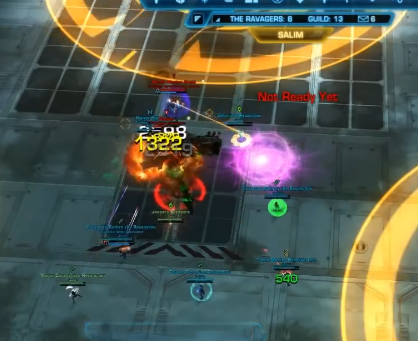 Ravager Ultra Scatterblast is a fairly large frontal knockback that is casted fairly often (9s CD). 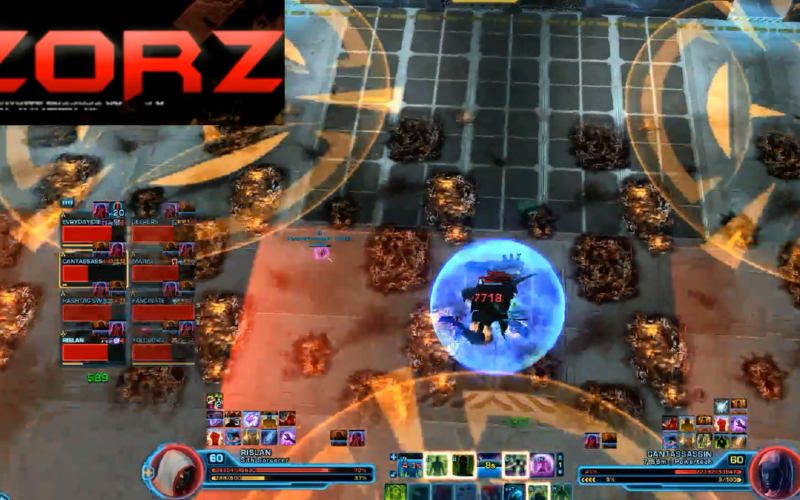 Tanks will need to face him away from rest of the group to prevent this knockback from cleaving the raid. Six random players in the raid will get an explosive mine attached to them. These explosive probes lasts for different durations but will explode prematurely if two player’s probe circles overlap. In addition to the explosion, there is also a knockback component. The cooldown on this ability is around 25 seconds. 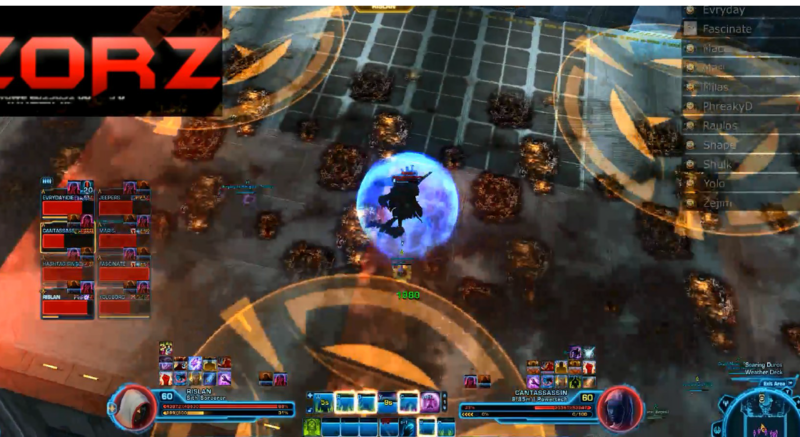 This ability drastically reduces the amount of area you have available to fight Blaster. It will cover the platform with giant yellow circles. The yellow circles deals enough damage to kill you from full HP in about 3 ticks, but if you have less HP to begin with you will almost certainly die within 1-2 ticks. Nevertheless, you should not cross the orange circles unless you absolutely have to. This mechanic also increase the difficulty of Resonant Explosive Probes as you now have a much smaller space to work with. Tanks will also need to watch that they do not get knocked deep into the yellow circles. At around 54% or so, Blaster will call down Master Astromech Droid (B0-55) to trigger transition into phase 2. The offtank will need to grab B0-55 when it arrives. Both Blaster and Master have this shield ability that they switch back and forth. When this shield is active, they take 90% less damage so you are forced to attack whoever is not shielded. To know which one of the pair is shielded, look for a blue shield around them or on the buff bar. This is one of B0-55’s attacks that is fairly deadly to melee. Anyone caught inside will receive a DoT that ticks for heavy elemental damage over time. B0-55 will follow the tank around when he does this spinning attack but with clever kiting, they can avoid many of the ticks. This attack has a cooldown of 32s. Channeled Beam attack that not only deal damage but also apply a stacking debuff called Deepening Wound that increase the target’s damage taken from this particular attack by 100% per stack. Fortunately, this beam can be blocked by other players to prevent the tank from getting all the stacks. 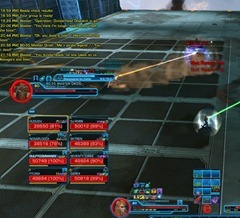 When another player steps in front of the beam, they will receive the stacking debuffs and can step out once the damage get too high. This attack has a cooldown of 24s. After fighting Master and Blaster for a bit, both droids will shield themselves and Master will start casting Rain of Pain, a 5s cast. At end of this cast, Master will disappear into the air and start carpet bombing the platform. You will need to run to a spot not occupied by the red bar as the red area will receive a bombing in a few seconds. This ability has a 85s CD. These two mechanics are only seen in Phase 3 once Blaster finish casting Rejiggering. Master Droid will start channeling a frontal cone called Ion Pulse Wave. 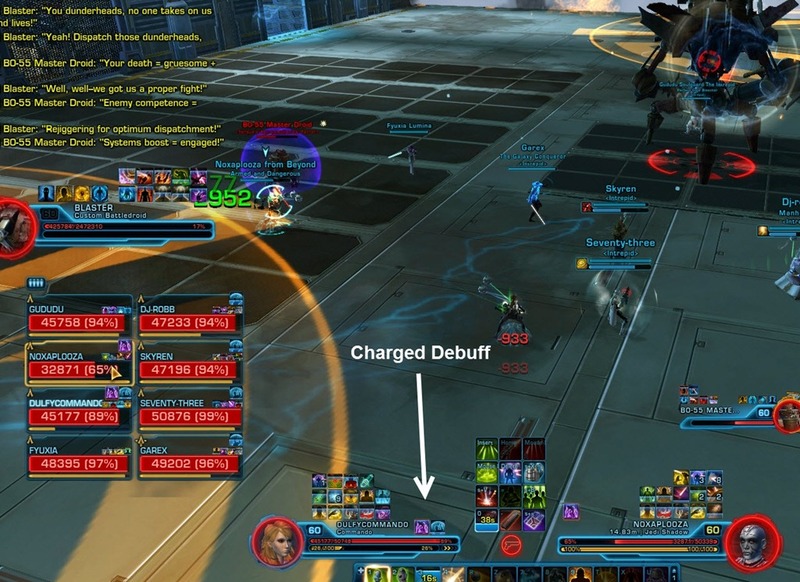 This attack applies a special Charged debuff to you that is actually beneficial. This debuff will Magnetically cling you to the deck at the cost of 15% movement speed reduction. The tank that is tanking B0-55 will want to turn him around when he channels this so that everyone get this debuff. With this debuff, you won’t get knocked off by Blaster’s special Ravager Electro-Pulse Nova. 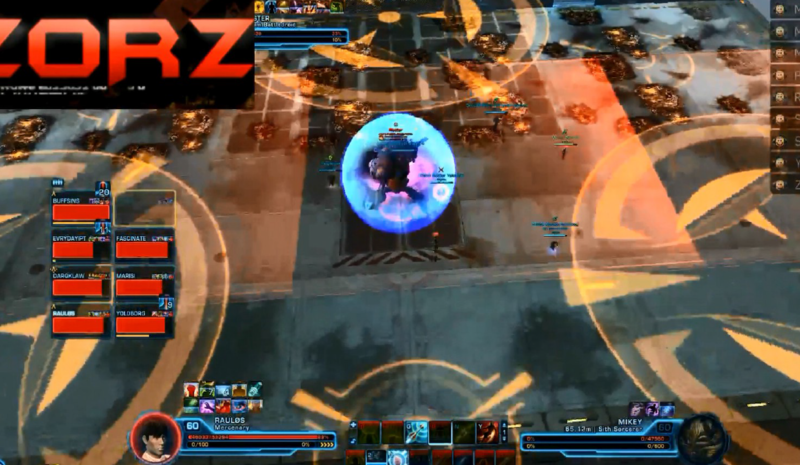 Once you bring Blaster down to 9%, he will self-destruct with a giant red circle. There is also a huge knockback that will hit everyone on the platform. Make sure you plant your back to a wall or you may get knocked off. All players should be very familiar with the patterns in Phase 1 so that they can react quickly and without killing other members of the raid when trying to reposition. Storymode is a good way to study the patterns and get some practice, in addition to reading this guide and watching videos of successful clears. 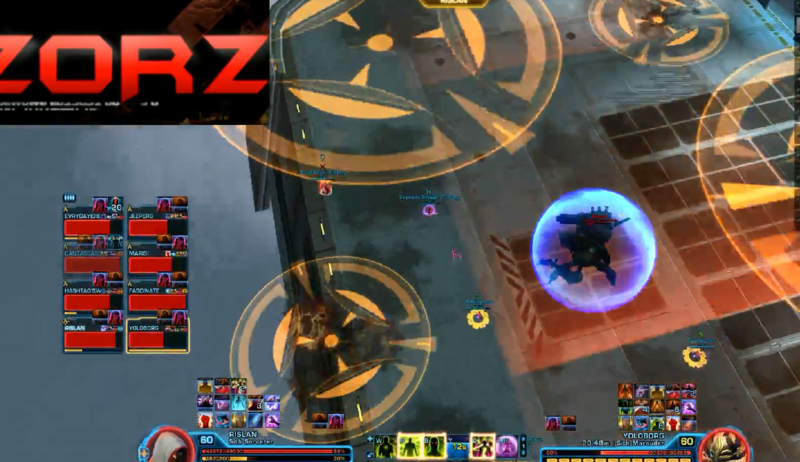 Have the raid position behind Blaster on the far edge of the platform. Tanks should stand on either side of Blaster on the entrance side. If your raid composition is unbalanced with few melee, you should consider having some ranged players play in melee range. These players will be responsible for moving through Blaster quickly when necessary, so leave slightly slower players at range. If in doubt, healers are an especially good choice since they all have good movement options and will favour being close to tanks. 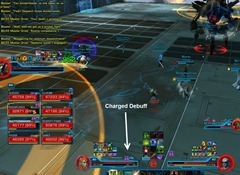 Up to 3 melee DPS can be managed by assigning left/middle/right DPS positions whenever on Blaster. Healers and any remaining range can stand behind these melee. With 4 melee DPS, you may have to get a bit more creative since space gets extremely tight. For any non-Assassin tanks, you should consider assigning 1-2 players to that tank help eat stacks from their Overpowered Ion Cutters in Phase 2. Healers should DPS for the first 15-20 seconds of the fight other than topping tanks back off from the Ravager Ultra Scatterblast knockback. Phase 1 – Blaster (100%-53%). Phase 2 – Blaster/B0-55 (B0-55 to 50%). Phase 3 – Blaster/B0-55 (both to 9%). In this phase, you only fight Blaster, but the yellow circles (Thermite Rocket Mortar) which periodically spawn take up most of the space in the arena. These spawns are RNG so good raid awareness is required to deal with the mines at the same time. First we discuss dealing with the Resonant Explosive Probes (mines). 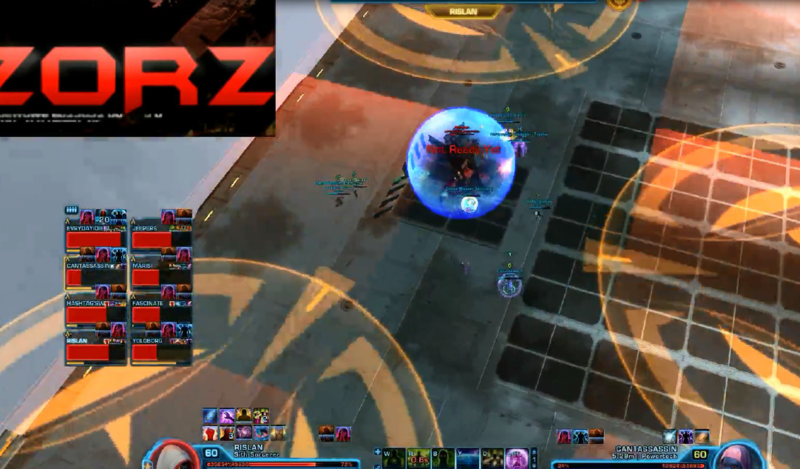 When Blaster casts Resonant Explosive Probes, everyone in the raid should spread out to at least 5m meters apart to avoid detonating the mines immediately when they spawn on players. A good rule of thumb is that mines will not detonate unless the edge of one player’s circle touches the player model of the other, but avoid cutting it too close. One trick to avoid having to deal with mines while moving around is to get rid of some of them. Players with Hold the Line/Hydraulic Overrides and/or Hunker Down/Entrench can easily pair off to eliminate mines in this way, although note that you will still take double damage without a defensive cooldown, so be careful. You can also do this without cheeses, but you must be careful not to do it near the edge of the platform since you can easily bounce off. Here are some examples of transitions from multiple perspectives, showing how you can see what the pattern must be before all of the new circles have spawned. A short explanation of the picture is provided for each example. THRU RIGHT. Two circles near left/right on ledge side. Must be going THRU. Which side? No circle on middle wall side, so it’s not dependent on who is tanking. Notice a circle forming on the right on the wall side, so THRU RIGHT. THRU LEFT. Two circles near left/right on ledge side. Must be going THRU. Which side? No circle on middle wall side, so it’s not dependent on who is tanking. Notice a circle forming on the left on the wall side, so THRU LEFT. SHIFT FAR RIGHT. Can see circle mid on wall side and circles on middle portion of either far left/right side are not symmetric so not THRU. There is a near left circle on the ledge side, so it is SHIFT FAR RIGHT. SHIFT FAR LEFT. Can see circles left/mid on wall side (so: not THRU and also we know it’s SLIGHT RIGHT or SHIFT FAR LEFT), however there is a near right circle forming on ledge side, must be SHIFT FAR LEFT. SLIGHT LEFT. Can see a circle far left and mid right on the ledge side. Also, there is a circle on the right wall side, but it’s nearer to the wall than the right edge of the platform, so definitely not THRU RIGHT. This is always SLIGHT LEFT. SLIGHT RIGHT. Can see a circle far right and mid left on the ledge side. Also, there is a circle mid on the wall side, so SLIGHT RIGHT. THRU EITHER. Two circles near left/right on ledge side. Must be going THRU. Which side? There is a circle on middle wall side, so its THRU EITHER. Then just see boss is facing to the right, so THRU LEFT. Here is an example of the above scenario in practice. 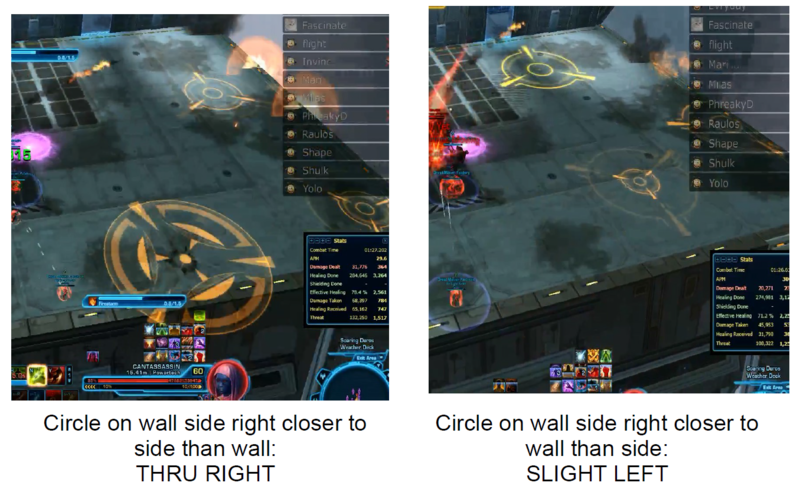 It has to be THRU RIGHT because there are two close left/right circles on ledge side and the circle to the right on wall side is closer to the side than to the wall. 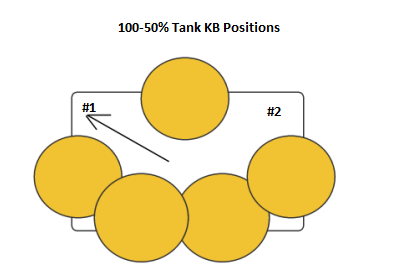 Tanks: Despite all of the different yellow circle patterns in Phase 1, tanks only need to worry about getting knocked back to one of two spots. Despite what everyone else in the raid is doing, all you have to do is see which one is open and face the boss that direction. Be careful not to angle too much towards the electric fence at the entrance which will kill you if you hit it. The two positions are pictured in the diagram below, which is arranged from the perspective of someone facing the entrance. 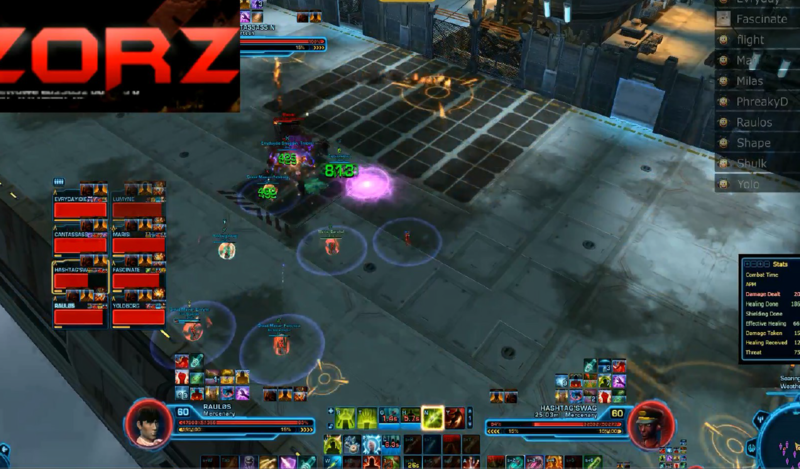 As one tank is knocked the other tank will need to taunt ASAP or tank #1 will receive a second KB. 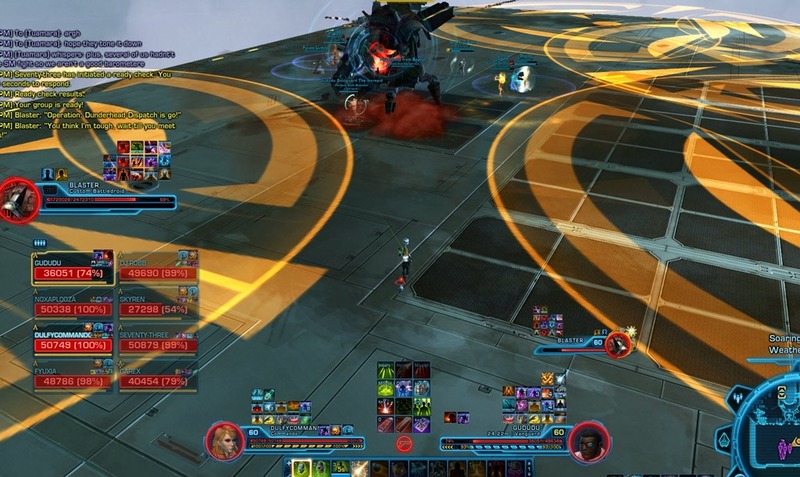 Tanks should save all cooldowns for after when the little droid comes down. The first phase should last for two to four yellow patterns depending on your gear and DPS. We generally find in full 198 gear it should last 1-2 patterns on 16 man, and 2 patterns on 8 man. There are a few other things to know about Phase 1 tanking. When both tanks receive Resonant Explosive Probes they will need to make space for the other tank to run back after getting knocked away. Generally this can be handled by having one tank pivot in/out of position remaining close to the boss, while the other pivots in/out of position remaining a few meters away from the boss. Loss of threat in the opener will most likely lead to a wipe, because losing aggro before a knockback will kill everyone in the raid. Therefore, it is crucial that you mind how you use your taunts in the first phase. The tank pulling should open with a single taunt (to have it off CD after first KB) and use a AoE taunt to ensure threat in the opener. Loss of threat in the opener will most likely lead to a wipe. While opening with a single taunt may seem strange, pairing this with your AoE taunt absolutely ensures you have threat at all times before the first knockback, so it is the optimal opener. Once the other tank gets their KB, your single taunt should be up. After that, you only need to single taunt off the other tank every time they get knocked back. DPS: The DPS task is very simple in Phase 1 with only one target. 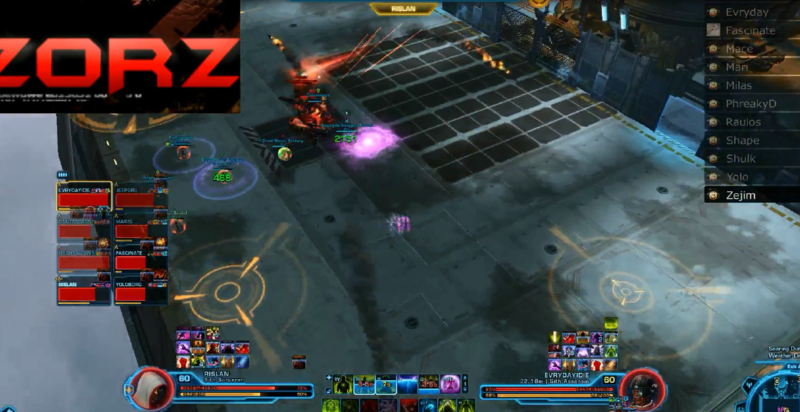 Your main job is to watch your position closely in order to keep yourself and fellow raid members alive. If you are a melee DPS, this means staying to your respective assignment and not blocking tanks who may have mines and need to get in front of Blaster and taunt for the next knockback. Also, DPS in the front of the ‘pack’, so to speak, have the biggest responsibility to ensure transitions are a success. Raid members in the back rely on those in front to move quickly and not hesitate, since traffic jams create deadly explosions with mines. Your DPS is irrelevant during a transition if anyone dies due to coordination issues. So make sure you just run through or step to the side immediately. Then find a way to continue DPSing. Finally, if healers vocalize that they need space to be in range of the tanks, you should move aside immediately even if it means you can’t DPS for a few seconds. So be prepared to shuffle around a bit after each transition to ensure healers and tanks are fine. Healers: The biggest challenge is staying in range of the tanks. If possible, you should volunteer to play a melee role (unless you have several melee DPS already) since this will help you stay in range of your tanks. 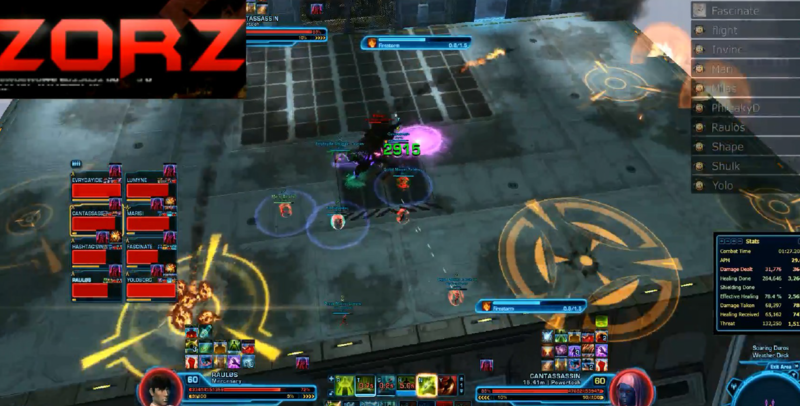 Your number one priority by far is to continue to heal the tanks up from Blaster’s auto attack and cleaves. The only damage anyone else should take are Resonant Explosive Probe detonations, in addition to perhaps a few ticks of yellow or Blaster’s Trample attack while repositioning. This is the only phase you should really consider adding DPS since healing gets more difficult in Phase 2 and Phase 3. 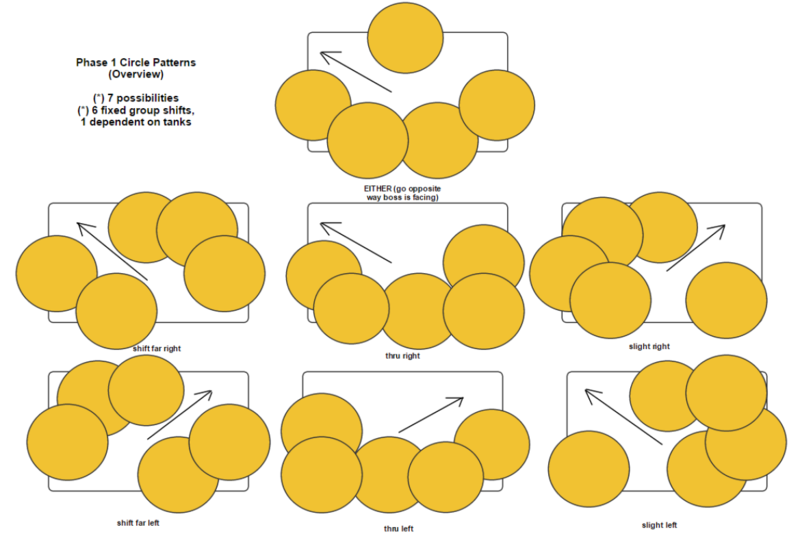 While it can be stressful to throw in some DPS, you will get fewer sets of yellow circles, which means less repositioning and potential for death in the long run. Save all of your important healing cooldowns for later. For example, there’s not really any need to pop Supercharge Gas or run out all your energy and regen. That should be something you do soon into Phase 2 in order to stay ahead on healing. Suppose you have two healers, one playing generally on the left (facing Blaster’s back), and the other on the right. The healer on the opposite side from the tank being knocked back is more likely to be out of range, so the healer closer to the tank always has the highest responsibility of ensuring their survival. This is especially true during transitions, which can make it more difficult to continue to heal normally. A few seconds before each transition, healers should save any good abilities that let them do some healing on the move, so that healing does not have to stop. Generally your raid should make room for you to stay near the tanks since the DPS check is not very high on this fight. Slow DPS only means that phases last longer, so you should always be given some space by everyone when needed. When you get more experienced, you will be able to do almost everything normally even while watching mines and yellow circles. Now you fight both Blaster and his droid, B0-55, at the same time, which requires more work on the part of the tanks. However, this phase is more straightforward to deal with because while the amount of outgoing damage is much higher now, the yellow circles (Thermite Rocket Mortar) now assume fixed spawns so there is no more RNG. You will also have to deal with one or more Rain of Pain barrage sequences throughout this phase. Your goal is to get Blaster to 23%, then push B0-55 to 50% and phase to the final stage of the fight. This means splitting up your DPS in some fashion. 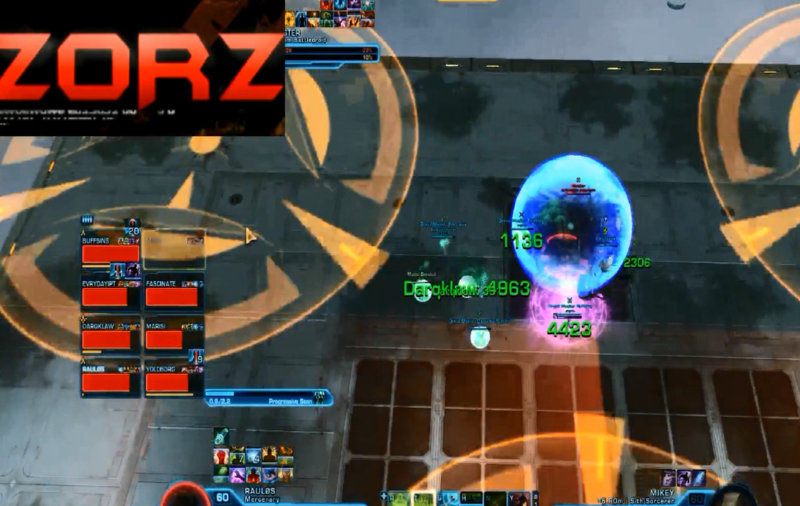 We recommend putting ranged on B0-55 and melee on Blaster to the greatest extent possible. 1) Five to six auto attacks. 2) Fire Wheel of Death. Fire Wheel of Death is a straightforward AoE. Every Overpowered Ion Cutter, B0-55 casts a frontal beam which adds stacks to the closest player to the beam and deals damage per stack. This can be resisted via defensive cooldowns and/or raid members can take stacks for you, although non-Shadow/Assassin tanks will almost certainly need someone to intercept a few stacks. Since everything happens in fixed locations, we assign fixed locations for each role. For our raid group, this means that the main tank with Blaster is west, the off tank with B0-55 is north, and the rest of the raid is somewhere on the east side of the map. This is your safe zone to work with, where you know that no one else will interfere. Resonant Explosive Probes (mines) continue to be deployed throughout this phase, so you will need to be as mindful as in Phase 1. They are particularly tricky to deal with during Rain of Pain since Blaster will cast Ravager Electro-Pulse Nova periodically, which forces all mines to be detonated. Also, mines will be reployed once during Rain of Pain, so you cannot simply stack with the rest of the raid. 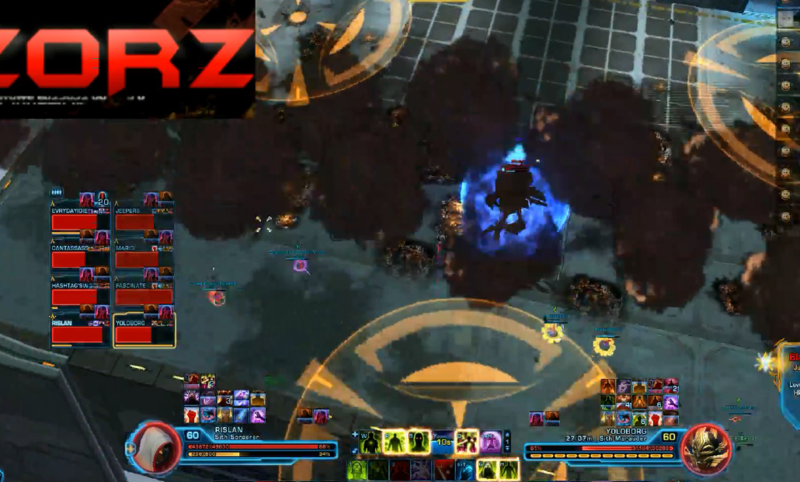 If you are unable to get to safety you will need to pop a defensive cooldown, but you will not die on Hardmode. Luckily with some good planning and knowledge of the possible Rain of Pain patterns, you can usually get to safety. Every time Rain of Pain is finished, ensure that you move to a safe location to continue Phase 2. 1) WALL HALF – Ledge half safe. 2) LEDGE HALF – Wall half safe. 3) WALL/LEDGE THIRDS – Mid safe. 4) MID THIRD. Wall/Ledge safe. At the same time, yellow circles will be on WALL MID and LEDGE CORNERS until during the 2nd barrage, at which point they swap to WALL CORNERS and LEDGE MID. What is tricky is that yellow cricles do not fully dissapear until a few seconds after the new ones start growing. So you will temporarily be squeezed on space. Just be prepared to move into the space where the old circles were, even if they haven’t dissapeared yet! COMMON MISTAKE: People going to ledge corners after 2nd barrage explodes on mid are dooming themselves. In this example, only WALL MID will be ultimately safe. Everyone should be going mid and staying away from edges. FOLLOW UP TO COMMON MISTAKE: Of the people in the bottom right corner, 2 will die when there is a mad rush for WALL MID. Going into 3rd barrage like this, everyone should know that either MID OR WALL MID will be safe and never gravitate towards LEDGE during 2nd barrage in case this happens. Tanks: The yellow circle spawns statically switch between two possibilities from this point on, so tanks will now be tanking knockbacks in one of two locations. The tricky part is that one yellow circle doesn’t quite dissapear before the other starts growing, so you need to aim somewhere between the two in order to be completely safe. This way you don’t land in any bad spot, but you can also run around back to Blaster using the space from the dissapeared circle. So both tanks will be busy full time, since B0-55 must also be tanked. Note that you do not swap off Blaster at every knockback now since knockbacks come slower and the key is actually who can afford to be holding B0-55 for the next Overpowered Ion Cutter, since every time Ion Cutter adds a stack, it ticks for a multiple of your total stacks. At around 18+ stacks, you will surely die in the next tick or two. After each Overpowered Ion Cutter, you need to tank swap. Handling the Ion Cutter itself is simple. Either use defensive CD’s (Saber Ward, Resilience/Force Shroud, Battle Focus/Explosive Fuel) and/or use 1-2 raid members to come in and take stacks for you. If you don’t end up taking very many stacks at all, the tank swaps become less crucial and can be done at your convenience. Shadows/Assassins are the best tanks for this mechanic because they can take the first 10 stacks, then Resilience/Shroud the remaining 10 stacks in order to take minimal damage. You will still have 20 stacks of the debuff, however, and require a tank swap. 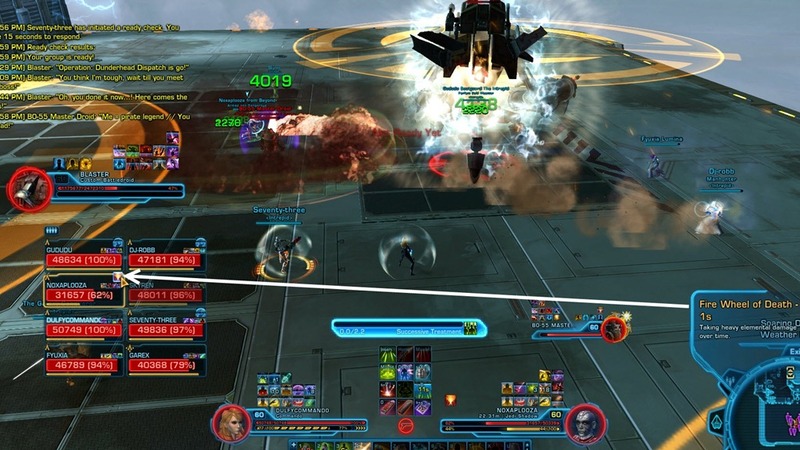 For Fire Wheel of Death, it is possible to kite the droid so that you take very few attacks from it. You can be very clever with this. For example, use a movement speed increase and run away from Blaster. 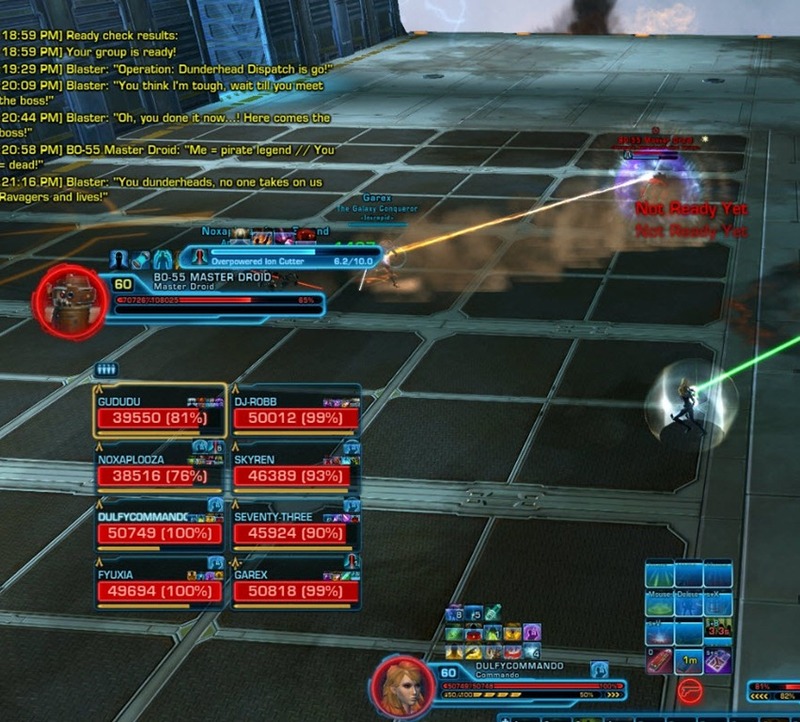 Then Phase Walk/Leap back to Blaster which will keep B0-55 out of your range for a few seconds. 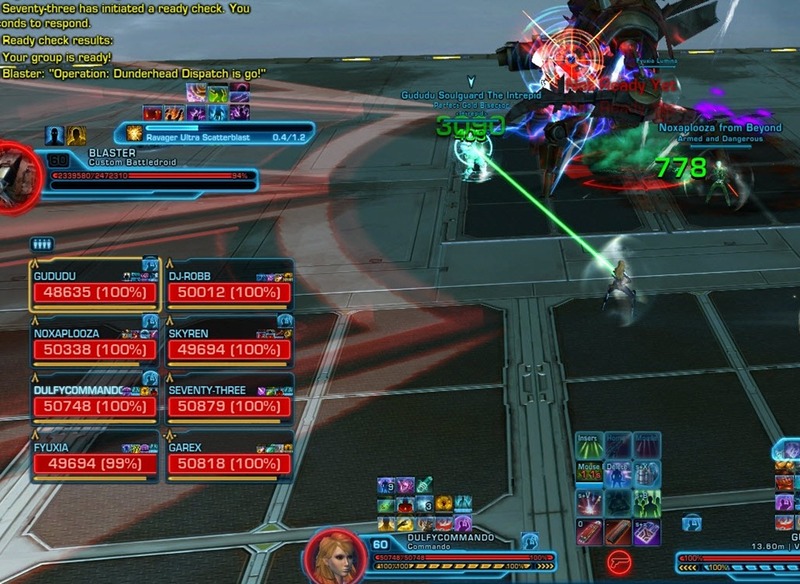 Make sure not to run too far away from your healers since they will be trying to keep both you and the tank on Blaster alive at the same time. It’s better to take a few extra ticks of damage but be in range of the group. DPS: The DPS should get Blaster down to 23% (at which point he shields himself) while whittling away B0-55’s health to 50%. B0-55 pushes to Rejiggering (Phase 3) at 50% so you need to make sure Blaster is as low as possible for that phase. Luckily this works out very conveniently for most group compositions. 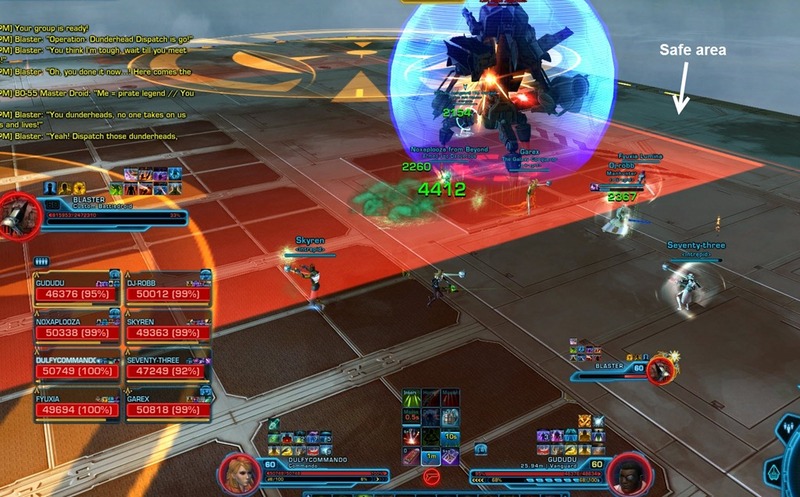 We tend to have all 4 DPS start on Blaster from 53% through the first few rotations of B0-55’s attacks (around the first Overpowered Ion Cutter) Once that tank has solid aggro on B0-55, any DPS that can conveniently attack B0-55 ought to begin doing so. This usually means that melee DPS (other than Vanguards/Poweretechs) will stay on Blaster as long as possible since they have a difficult time attacking B0-55. If you have a heavy melee composition, you will either need to take extra damage from the Fire Wheel of Death (using a few cooldowns) or assign any melee with any sort of ranged abilities (Operatives and Powertechs in particular) to B0-55, and have the other melee switch whenever Fire Wheel is inactive. Transitions are very easy in Phase 2 since there is no longer RNG, so there should be no surprises. Be ready for each reposition in advance and continue to give your healers plenty of space. 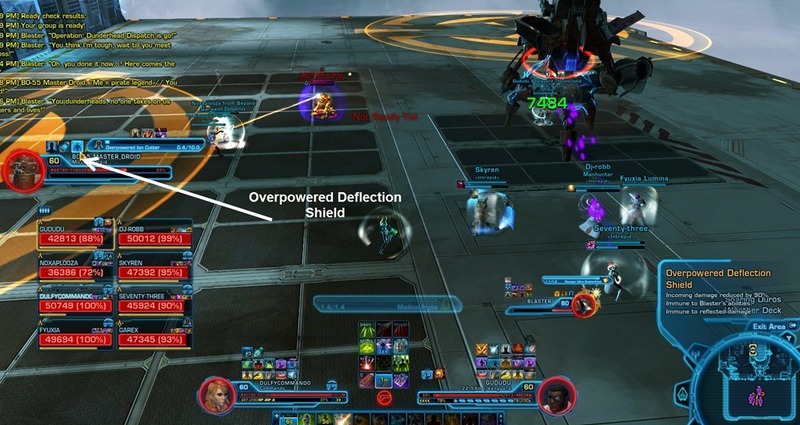 If you have good defensive cooldowns, you may be called upon to intercept the Overpowered Ion Cutter attack from B0-55. Whether you are ranged or melee, you should be able to keep DPSing while you do this. The only challenge is making sure that you are nearby B0-55 when it is your turn, without exploding any mines by accident. 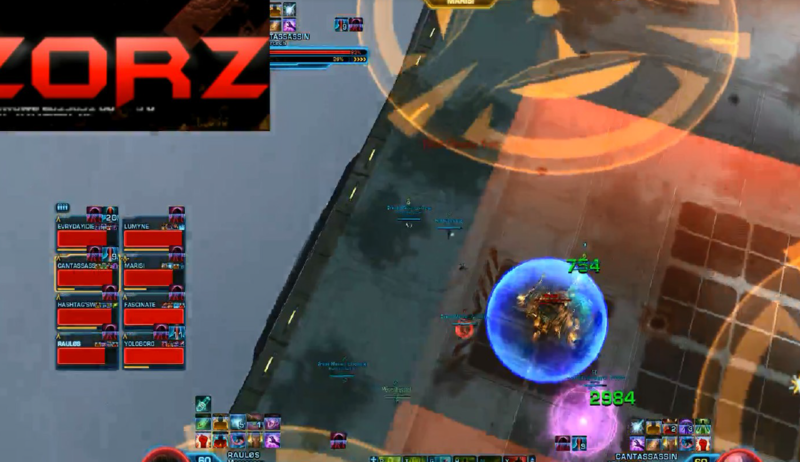 Healers: This is the most intense phase of the fight to heal since both tanks are taking high amounts of damage, and the raid continues to receive some damage, either from the Overpowered Ion Cutter or Resonant Explosive Probes. 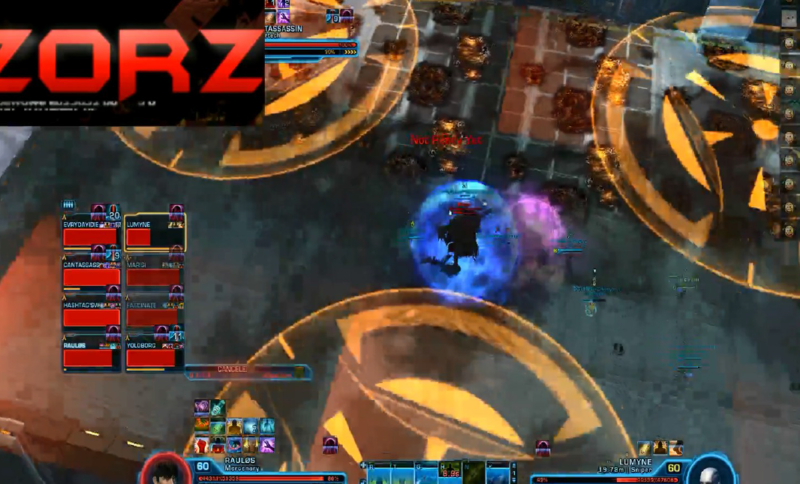 Try to maintain a central positioning, with any melee just in front of you, and ranged DPS behind you. You should be popping your major cooldowns early in this phase in order to stay ahead on healing. Also, if you use any major cooldowns too late in Phase 2, you will not have any extra heals to help keep the tanks alive during Rejiggering (Phase 3). So focus on staying ahead and playing aggressively for the first minute or two at least until B0-55 is below 60%. 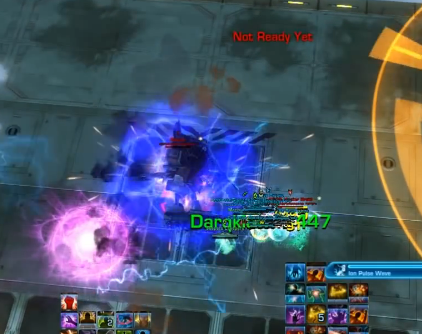 Remember that while the off-tank on B0-55 and the rest of the raid will take consistent periodic damage, your highest priority continues to be ensuring that the main tank taking Blaster’s knockback does not get killed. They will take a big spike of damage from the knockback and potentially additional damage from a tick of the yellow circles or a mine explosion after the knockback. Keep track of who is tanking Blaster so that you do not forget to top them off. Also, during the Rain of Pain barrage phase, you have a very good chance to top up most of the raid, assuming people don’t take much extra damage. However, your main priority coming out of Barrage is to ensure both tanks are at very good health so that they don’t die quickly once Blaster and B0-55 begin their normal rotations again. 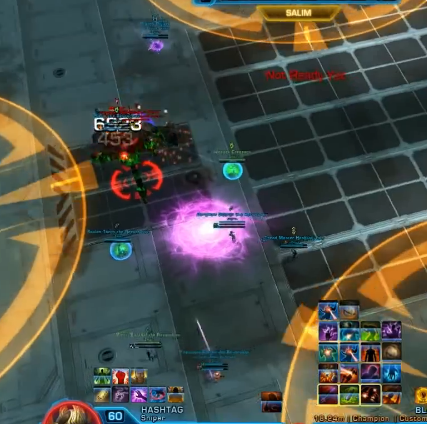 While B0-55 casts Rejiggering, everyone in the raid must regain the Charged debuff after every Ravager Electro-Pulse Nova (huge knockback) from Blaster. 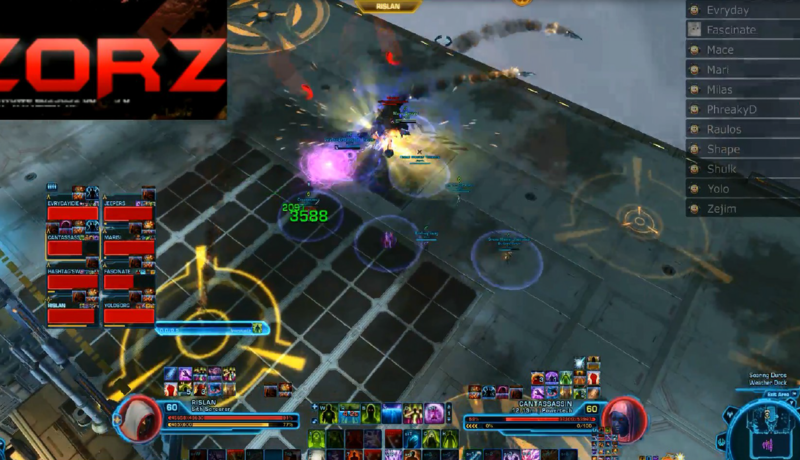 You must time the kill on B0-55 so that Blaster is close to pushing as well, otherwise the raid will die. The tank with B0-55 will receive a debuff that increases damage taken per stack. These stacks do not go away. This means that one tank will hold Blaster while the other holds B0-55, frequently swapping to keep both tanks at as low of stacks as possible. Above 30 stacks, tanks are at high risk of dying, even using defensive cooldowns. By 45+ stacks, tanks will get pretty much one-shot. In some sense, this is really the only DPS check of the fight, since if your DPS is very low, the tanks will die to damage taken at high stacks and then everyone will die in short order. Otherwise, this phase is really not too difficult. Blaster no longer does huge knockbacks so he is not much of a threat. 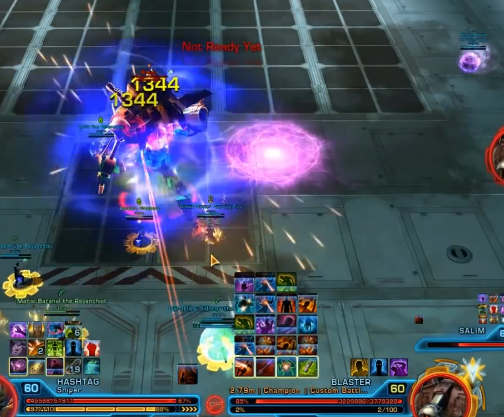 The tank on Blaster should just be DPSing him, while the tank on B0-55 is responsible for turning B0-55 around after each Ravager Electro-Pulse Nova, which removes the Charged debuff from the raid. Once you ensure that the Ion Pulse Wave hits everyone and gives them that debuff, turn B0-55 back around to face away from the group. DPS: It doesn’t really matter who puts DPS on which target, as long as you have the right balance. 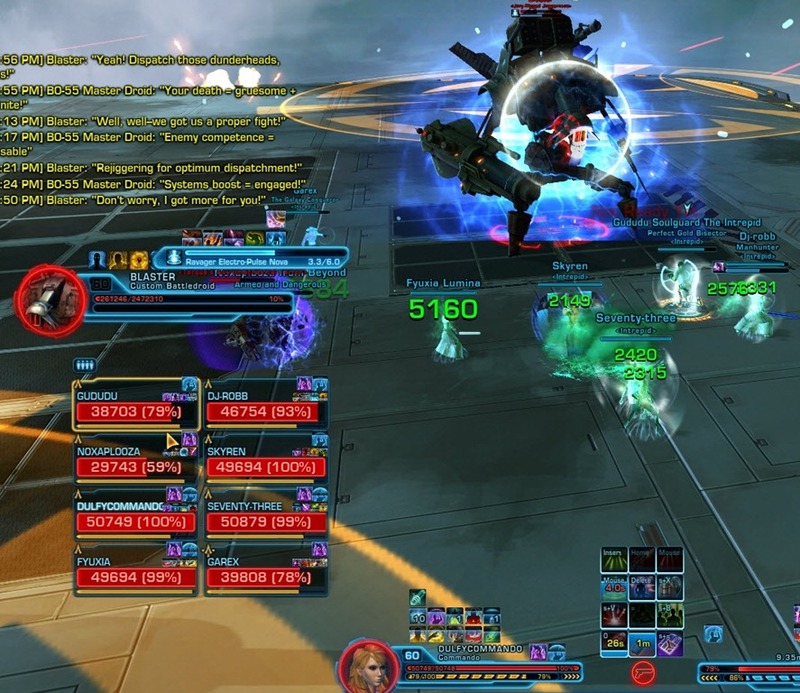 Generally you will have a DPS and a tank on Blaster, with the rest of the raid on B0-55. 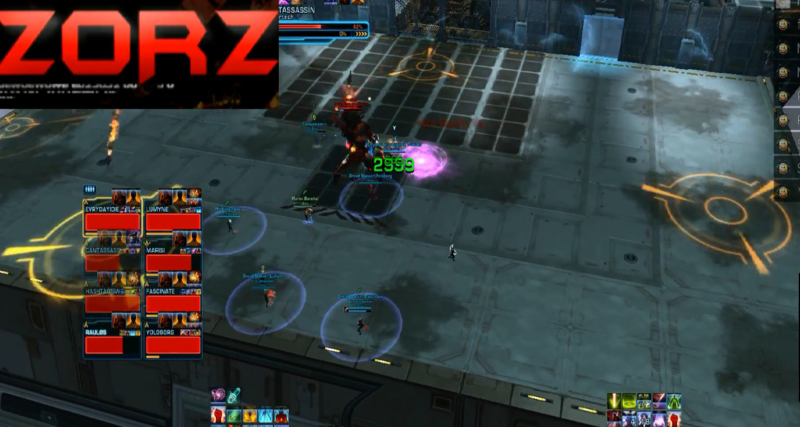 Once B0-55 is under 20% and Blaster is under 15%, you should start coordinating to time the kill. What you want to do is push B0-55 to 9% right after you have received the Charged debuff from B0-55 again after it was removed by a Ravager Electro-Pulse Nova (huge knockback) from Blaster. This gives you the maximum amount of time before the next Ravager Electro-Pulse Nova to kill Blaster. Blaster should be around 11-12% at this stage. If you push Blaster before B0-55 is dead, B0-55 will heal him back up and it is very difficult to win at this point, since tanks will be at high stacks and close to death. 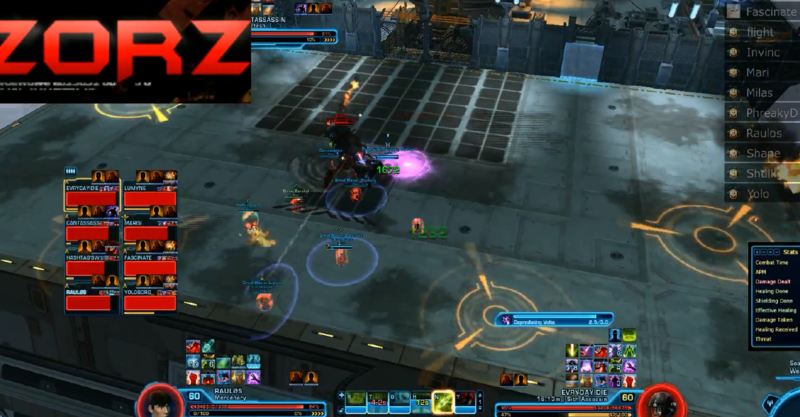 Healers: You need to do a minor amount of AoE healing to recover from the Ion Pulses on the group and the Electro-Pulse Nova hit, but all your focus should be on healing the tanks. Generally the tank with B0-55 will take the most damage so ensure you are full healing the tank with aggro on B0-55 whenever that tank has 20+ stacks. Unless the group is at very low health going into this phase, you can probably help put some DPS on B0-55 while tanks are below 10-15 stacks. After that, you will need to full heal. You should stop healing and only DPS Blaster as soon as B0-55 has been pushed. 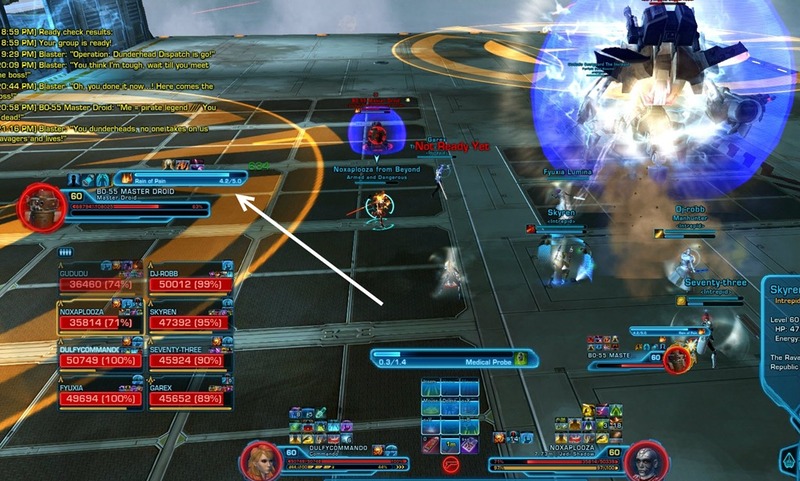 Unfortunately Saber Reflect does not work on the Overpowered Ion Cutter attack, otherwise it would reflect the damage which would be a huge advantage. However, all your other defensives are more than enough to compensate. Endure Pain is very useful as a tank when knocked far away from your healers. You can Guardian Leap/Intercede to an ally during the Rain of Pain barrage in Phase 2, but only if mines have not yet gone out. For DPS: if one or more tanks die, you can briefly tank Blaster and/or the B0-55 by using your taunts with any remaining defensive cooldowns, so be prepared to do this if called upon. 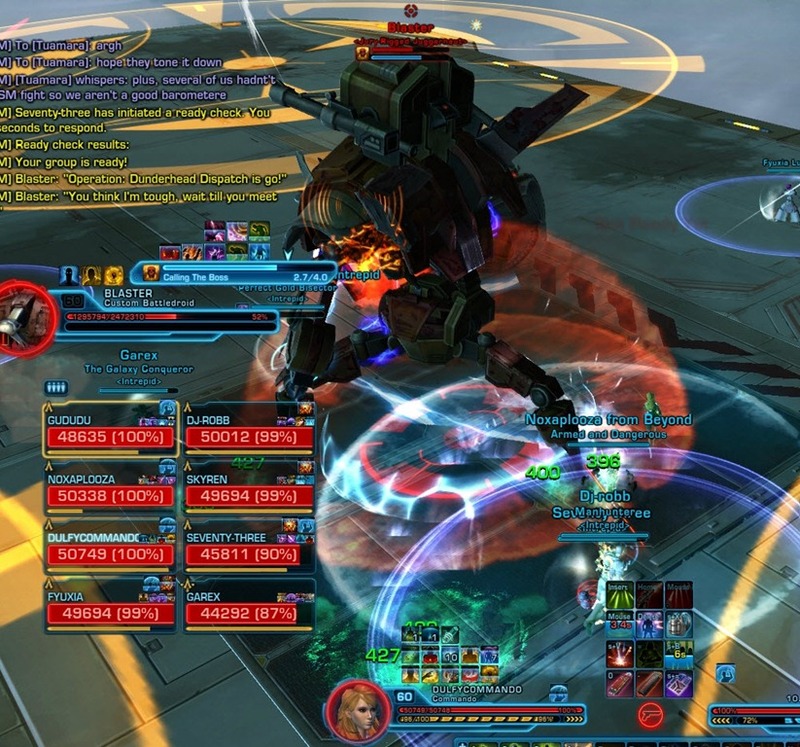 Transcendence/Predation is an excellent raid cooldown in this fight due to the heavy positional requirements. Use it for position swaps in Phase 1, as well as during Rain of Pain barrages in Phase 2. Make sure to warn your raid whenever you do this so that they do not accidentally step on one another. Guarded by the Force/Undying Rage can be used to survive extreme spikes if accidentally knocked into AoE telegraphs or targeted by Blaster or B0-55. Guarded by the Force/Undying Rage, Saber Ward and Force Camoflauge are all good for the Overpowered Ion Cutter and Rain of Pain mechanics. The DPS check on this fight is not much of an issue (especially if you can clear Torque). If are a DPS and you do not already have a Sage/Sorcerer healer, use Force Armor/Static Barrier aggressively on the tanks and anyone else at risk of taking spike damage. 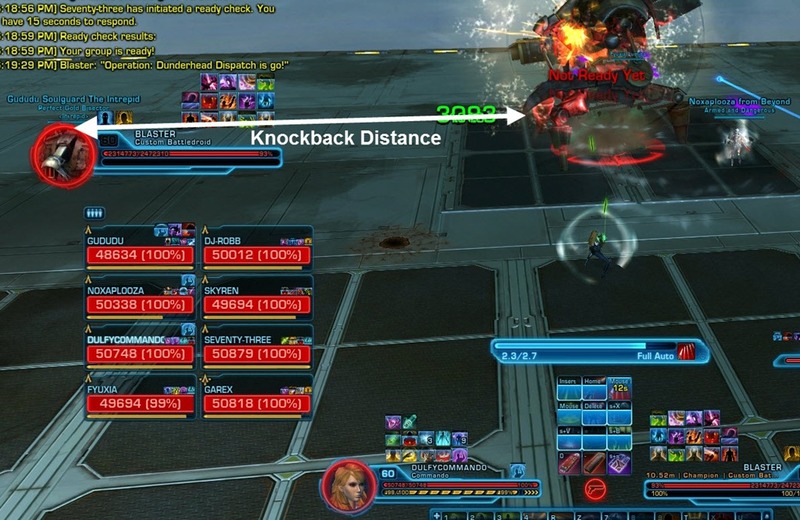 Force Barrier is one of the best cooldowns for Overpowered Ion Cutter, since it can be used to negate damage from all 20 stacks, as well as the knockback from Blaster’s Ravager Ultra Scatterblast if for any reason you have to block the beam whilst in front of Blaster. You can also use Force Barrier to negate all damage from Rain of Pain barrage if you are unable to get to safety. However, you should consider using your self-heal + Force Armor/Static Blaster first, since this combination is enough to survive the hit from Rain of Pain unless you are very low on health. 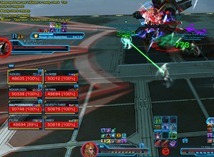 Force Barrier is better used on Overpowered Ion Cutter (see above) or another emergency situation, such as if you are knocked into a bad spot during a transition. If you are fast, you can use Rescue/Extrication to pull raid members out of danger. This should be done sparingly but quickly when necessary. Phase Walk can be an essential repositioning tool, so deploy it frequently. For example, you can use Phase Walk to plant a safe spot for yourself during yellow circle transitions in Phase 1 or barrage in Phase 20. Before hitting your keybind, make sure to check your Phase Walk location for other players whenever mines are out! Force Speed is your best bet in most circumstances for easily repositioning, so you should never have an excuse for falling behind the raid in movement phases. Resilience/Force Shroud is excellent for many mechanics in this fight, but particularly useful for resisting all damage while taking stacks from the B0-55’s Overpowered Ion Cutter in Phase 2. It can also be used to negate damage from any of the knockbacks, including the mine explosions throughout the fight. Hightail It/Covered Escape can be used to roll almost all sources of key damage, but should generally be avoided when mines are out or about to spawn. In particular, you can roll to reposition yourself on the map, but the sudden movement can be very dangerous to someone else who doesn’t anticipate your action. Also, you will momentarily be unable to move after doing so since you must roll into cover. Hunker Down/Entrench can be used to completely negate mine damage and the associated knockback. Just have another player (ideally one with Hydraulics so they don’t receive the knockback either) run into you with their mine. Your Scrambling Field/Ballistic Shield is best used during the high damage of Phase 2, and again during Rejiggering as the tanks get 30+ stacks. However, since the cooldown is 3 minutes, you should use it early in Phase 2 before the first Rain of Pain unless you have multiple Gunslingers/Snipers. Judge your group’s DPS to see if you can fit in an early Scrambling Field/Ballistic Shield or not. If Concealment discipline, you can use Scamper/Exfiltrate to avoid all damage from a variety of attacks such as Overpowered Ion Cutter and Rain of Pain. Just be careful not to roll into other raid members with mines since you can get them killed. You can also roll to stay alive if knocked into yellow. Generally you should not roll relatively trivial damage such as small ticks or mine explosions. 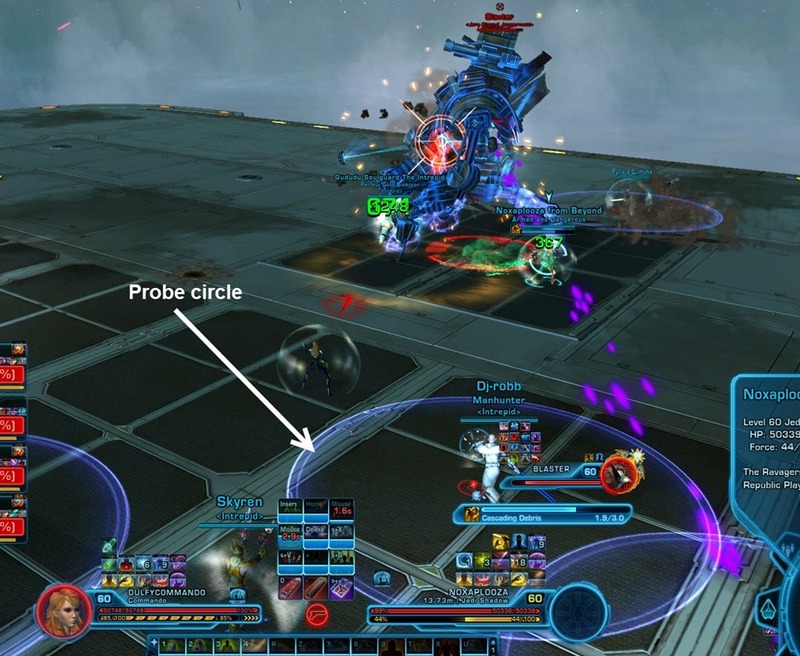 The upgraded Shield Probe utilities in the Heroic tier are generally your best bet. Make sure to also grab anything related to movement speed. Hold the Line/Hydraulic Overrides is extremely powerful for many reasons, so use this aggressively and take all related utilities. 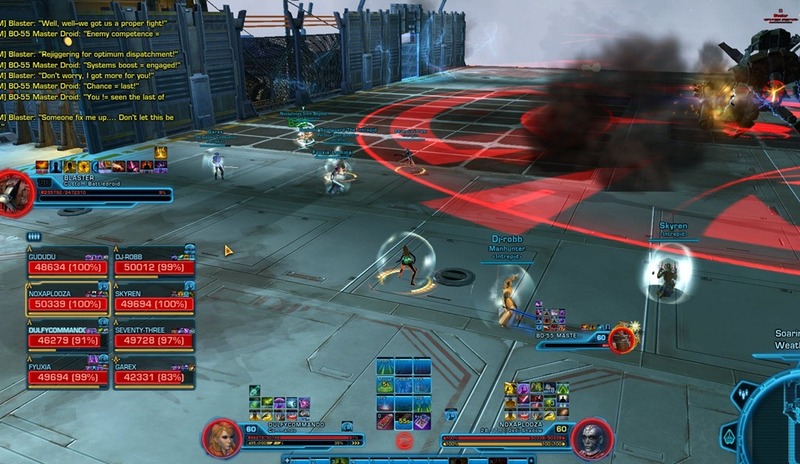 While tanking, you can use these abilities to resist Blaster’s Ravager Ultra Scatterblast knockback. You can also use them to prevent any knockdown/knockback from mines throughout the fight. For example, this lets you run into other players and get rid of mines whenever you want. It also prevents you from getting knocked down by mine explosions while trying to get out of the Rain of Fire barrage AoEs on the ground. Energy Shield/Reactive Shield is excellent for DPS who are taking many stacks of the B0-55’s Overpowered Ion Cutter in Phase. Kolto Overload/Adrenaline Rush is very good for tanks being knocked far away from their healers to temporarily stay alive while taking additional damage. Hold the Line/Hydraulic Overrides is extremely powerful for many reasons, so use this aggressively and take all related utilities. You can use them to prevent any knockdown/knockback from mines throughout the fight. For example, this lets you run into other players and get rid of mines whenever you want. It also prevents you from getting knocked down by mine explosions while trying to get out of the Rain of Fire barrage AoEs on the ground. Full Auto/Unload does its full damage on B0-55, so use this to your advantage even if you are assigned to attack Blaster by tabbing to B0-55 every time Full Auto/Unload is available. 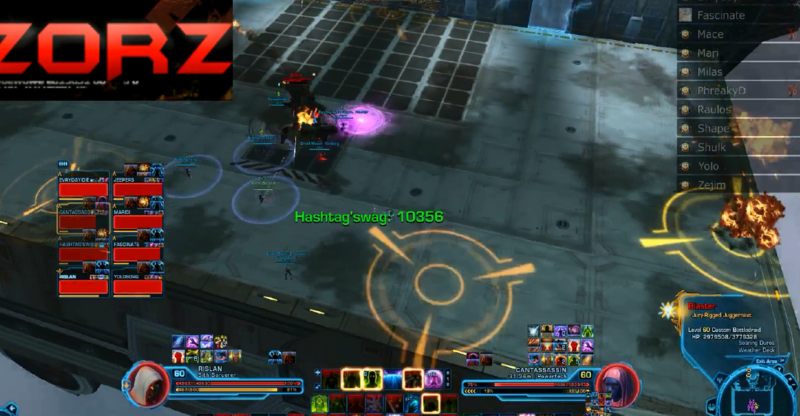 In this video, one of our main tanks (Smugglin) outlines the Blaster/Master HM fight from a tanking perspective. Nice guide but some of these images are horrible quality. Really nice to have multiple POV videos although, that isn’t found often. Yes I’ll be working on improving the image quality at some point by working from higher-resolution footage that’s now available. My own footage was pretty bad but it’s all I had to work with at the time of writing. Thanks for the feedback. Any video reference is better than none, especially in regards to sorc healing like myself. Sins/Shadow can cloak out of ion cutters if B0-55 is agroed on them making it end at 1 or 0 stacks if your quick enough. Oh, so they learned how to do it without 6 hydraulic overrides. About time. You say that like it’s a bad thing. So what if they’re all using the same move? when you’re going for world 1st kills of bosses why wouldn’t you bring a class that has a HUGE advantage on this fight? Doesnt this also drop 198 wrists? Killed this on my sin last night and realized that if I took the fade utility, I could cloak out during the 1st and 3rd Ion cutter, while saving force shroud for the middle one — we only got 3 beams total. This made it unnecessary for anyone else to take stacks, and saved the healers some pain.